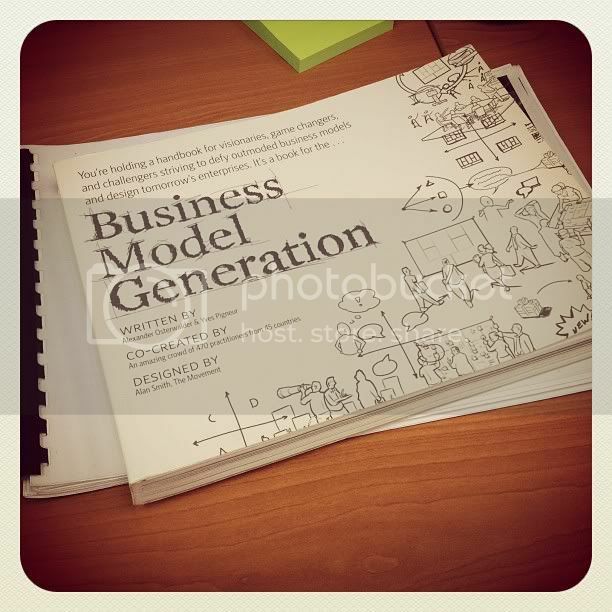 Reproduced from the blog post written by yours truly on the SGPad blog! I personally think that one of the most important attitudes to have at a startup is an immense hunger to learn and adapt. Everything and everyone has something amazing to teach you, should you possess the humility to learn from them. These days I define startups the way Eric Ries (of the Lean Startup – please read it if you’re into entrepreneurship!) does: a startup is a human institution designed to create new products and services under conditions of extreme uncertainty. That definition’s great because over my one year of entrepreneurship so far, I’ve realized that successful businesses rarely look like the business plans (or initial ideas) that spawned them (www.SGPad.com initially wanted to focus on providing rental sales to tourists). There’s just too much uncertainty creating new products for new markets that it’s really hard for entrepreneurs to just boldly go forward and think that they’re right all the time. So accept it. You’ll be wrong most of the time. But remember – a startup isn’t a test where you die when you fail – it’s rather like an ongoing series of experiments where you slowly find out what doesn’t work and what actually does. That’s why we at SGPad try every day to learn from feedback all around – customer feedback, experiments, and we’ve been also very lucky to have great clients who have themselves walked the path of entrepreneurship and shared their invaluable insights with us. Just want to encourage you guys as you embark on this journey of entrepreneurship and a small advice from someone who is just have the privilege of starting out a few steps earlier than you guys. Bit by bit, we will stay humble, learn and adapt our startup to fit the needs of the market. We owe it all to all your great people out there who cheer us on every single day. Thank you so much for your faith and support! It really has been a really long time since I last blogged! I guess what happened is that I have been really busy with Project Radius, SGPad.com and the many family holidays (Christmas and Chinese New Year are pretty important events for my family) that I just didn’t make time to write. Or journal. And that’s bad because with all the things that I’m doing lately, I’ve realized that a key practice for optimum performance is to be extremely mindful of who you are as a person, your personal (and business) strategy and how you can improve to get closer to your dreams. I guess it is not so easy to see into the horizon when you’re in survival mode, only focused at the immediate tasks before you, but as a leader, I believe it’s important to have a balance of the two and be able to take calm breaks to stand silently and gaze – not only into the endless potential of the future, but also into the richness of our pasts. Over the past two months I have been working hard on two projects – Project Radius and SGPad. Project Radius is a social opportunity engine that aims to help people achieve their highest potential through introducing them to people with the skills and resources that can help make their dreams come true. As young entrepreneurs, we are inexperienced and have to work with very limited resources. 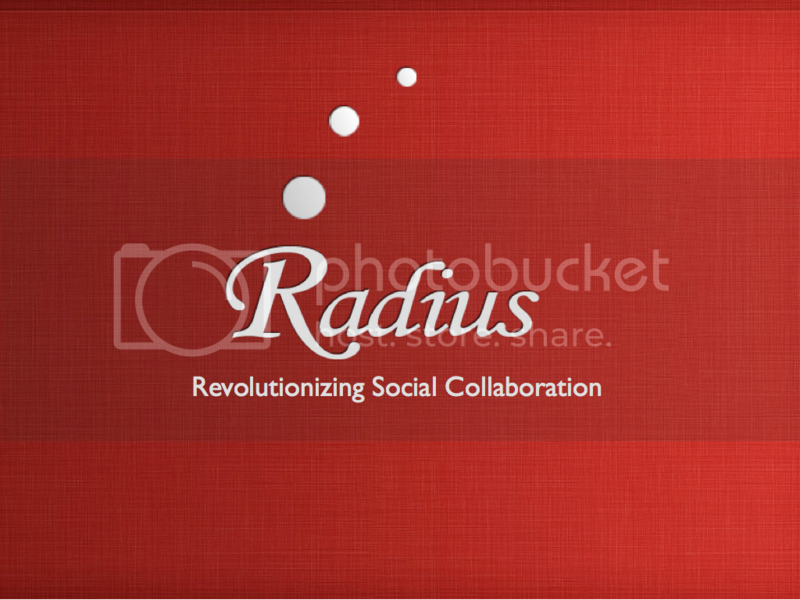 Project Radius aims to overcome that by giving you X-Ray opportunity vision to immediately find the people around you whom you can do great work with. We’re building this system as we realize that in actuality, all the resources we need are present all around us – it could be a family friend, a friend, or a friend of a friend – but we just didn’t realize it soon enough! We’re also trying to overcome the need for using business cards anymore – just “star” a friend you just met and you have your contacts all saved! I’m just blessed to have a talented team working on building the system, giving me the time and energy to pursue funding from the government (and business case competitions), talk to event organizers whom would like implementing our system at their events, as well as fine tuning our profit model. 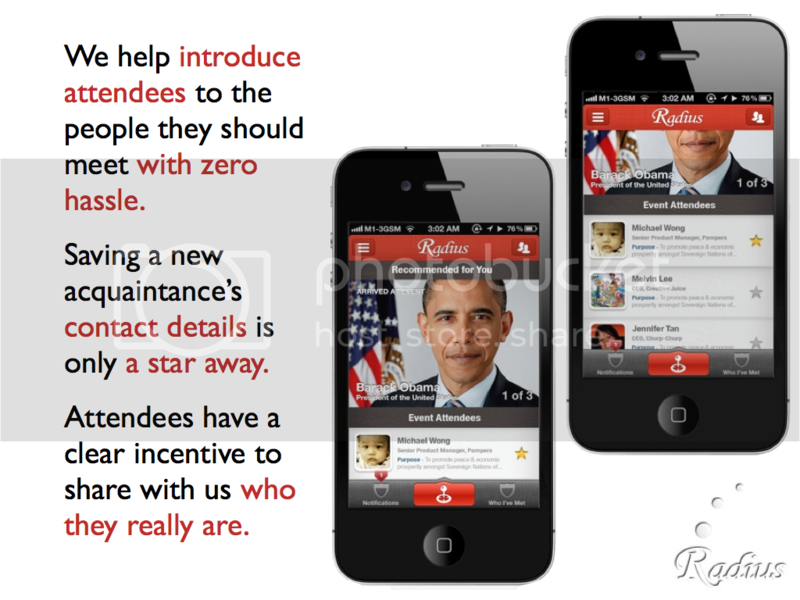 We’re looking to initially implement Project Radius at social and business events/functions, so if you know any event organizers whom would love to have a virtual host introducing your guests to each other in a way that maximizes the speed in which they achieve their personal and business goals, do let me know kevin@kevinc.net immediately! 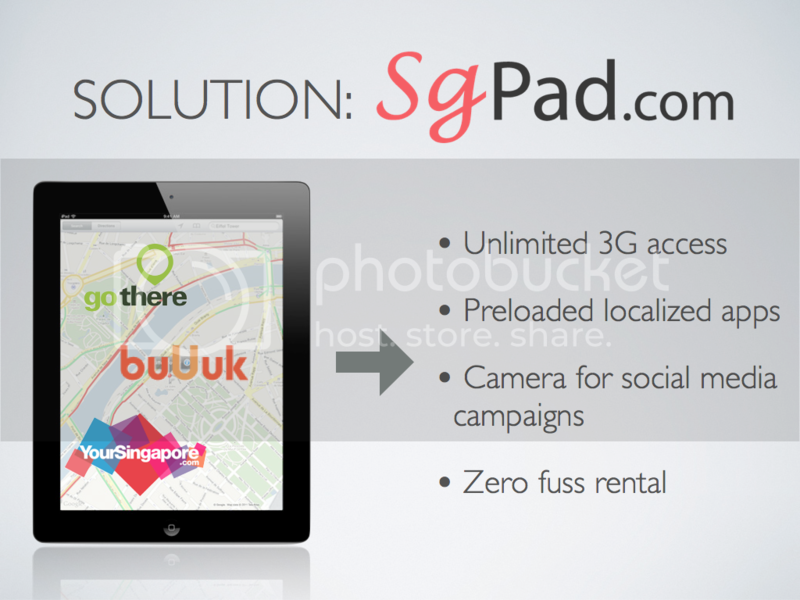 SGPad is a new service in Singapore that focuses on providing quick iPad rental to tourists and businesses in Singapore. Being geeks who love technology, we always thought that it would be really awesome to have 3G so we could have Google Maps in foreign lands so we would never get lost again. Hence, we developed SGPad to serve the tourist market. Since our launch, we have also had quite a number of requests from businesses who want to implement iPads in their work – be it to collect data for a survey, to enhance the learning experience for students on a learning trail or just to spice up an event – and are also trying to develop further capabilities to service this sector. Feel free to contact me personally if any of you have any iPad rental related needs! And to do so, I really need to be accountable for my actions this time – failure is not a problem. I’m assembling a group of people and what we’ll do is that we will plan a call to each other every day to check on each other every day to see how we’re doing up on the things we promised each other to do. We will all keep a log of our own tasks and routines and check each day to provide encouragement, support and inspiration to each other. Hopefully through helping each other we would learn more about ourselves and be able to push each other to achieve greater heights. Email (or SMS) me immediately if you’re interested in forming this group! Time for serious personal change in this most challenging year yet! The more challenging the situation, the more we have to grow to overcome it! Feels so good to write again, and I really want to be held accountable to writing (and journaling) on a regular basis. My personal development habit discipline muscles have become fat and flabby over months of neglect and I will focus to getting them all fit again! Focus on just business alone ain’t enough – it’s all about balance, and I’m going to get that balance back! 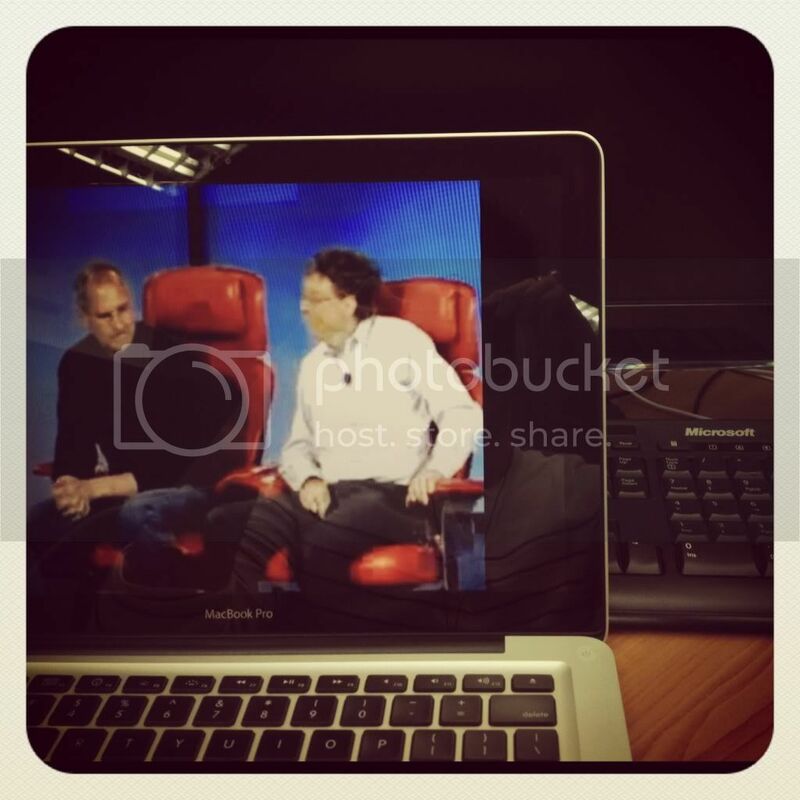 For the longest time I have really respected Steve Jobs’ work with Apple. He somehow really understood what made a great product, a great purpose and had the laser focus to really see that his team managed to push the boundaries on innovation to create products that literally changed the world. And he did that because despite all the flak he got for being an extremely difficult person to work with he managed to really inject emotion, feeling and the humanities into high technology – making the high tech finally accessible to the lay person. My respect for his journey has only heightened after reading his biography by Walter Issacson. Don’t get me wrong – it’s not because the book kept lauding how godly his intuition was, but rather that it showed you a clear picture of the man behind the company, flaws, hurts, quirks, insecurities and more. There’s just so much to learn from the man – not just his genius, but also from his failures and mistakes. 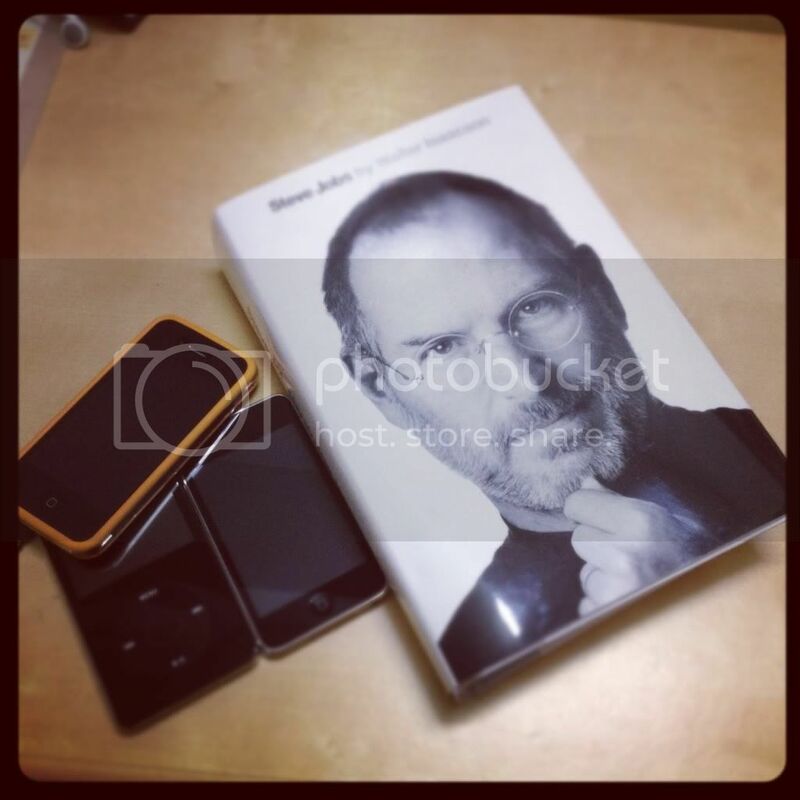 The book was wonderful – it brought me through the story of the personal computer from the eyes of it’s main protagonists – Steve Jobs and Bill Gates, and entranced, I spent an entire meditative Sunday afternoon finishing the book. "You and I have memories longer than the road that stretches out ahead." - Steve to Bill at the end of the interview. After reading the book I found myself watching clip after clip of Steve on YouTube, and here I really want to share with you some of the greatest clips ever for all of you to enjoy. Trust me, you’ll learn something amazing from every single one of them. Here Steve talks about how he believes that in this age of information overload and clutter how a brand really needs to have a laser focus on the core values that mean to them, and have the integrity to stick to them. Steve was a one-of-a-kind leader that put together great advertising, great positioning and great oratorical skills to really appeal to his customers down at their rawest, most emotional layer. Just watch how he does so by quoting Bob Dylan, producing an amazing, timely ad, and introducing a revolutionary device with the flair of a master showman. When you can get that deep, you’ve got more than half the battle won. One of Apple’s greatest strengths is their ability to focus. Too many big companies get caught up with thinking that they have the resources to do tons of things and they often end up overestimating themselves and spreading themselves too thin. Great companies keep real close to their vision and pursue it with a laser sharp focus. It’s a leader’s responsibility to be the holder of the team’s vison and make sure that the team keeps its eyes on the prize! What advice do they have for young entrepreneurs? Put great emphasis on attracting great talent and refining your intuition about people as even the smartest man in the world can’t build a great company on his own. I truly feel so blessed to have the great opportunity to learn all these great lessons from someone who has already made a big ding in our universe. Now it’s truly our turn to change the world. The cool thing about working on making a startup work is that every day you come into contact with so many new things to learn. There’s always new things you have to read up on, new technologies to understand, new issues to solve and the large variety of challenges that pop up make the great business thinking books we have around on the internet and in bookstores all so much more interesting and relevant! It’s really amazing to note that I’m probably going through business articles and books at a quicker rate than I was when I was still in business school! As i’m working on a technology-related startup, articles on technology and business all look so relevant to me and I really have a good time everyday reading up on all the wonderful material I have around me! It also pays to be surrounded with awesome friends who share what they learn in the business world with me as well! So I’ll just get down to sharing the two most important lessons I’ve learnt over the past few weeks, shall I? 1. A startup’s main focus in the early stages is product-market fit, not scaling. 2. In today’s cluttered world, focusing on radical (not your typical run-of-the-mill) differentiation is a necessity. Today, let’s spend a little bit of time talking about product-market fit (we’ll talk about radical differentiation some other day)! As someone who has great dreams of creating a world-changing, profitable startup, I can understand the urge to want to grow your startup up big real fast through securing venture capital, hiring a large sales team and broadcasting it to every single person you possibly can as quick as humanly possible. Sounds like just the thing to do with that bright idea you just had right? Just scale it up as big as possible in the shortest possible time frame? Well, that’s completely true if… the many, many assumptions you made about reality in your business plan were all accurate. And the odds are that you probably have a couple of glaring mistakes in the model somewhere. And just how do startups work on getting those assumptions right? Not by just looking at research papers and reports, mind you, but mainly through real-world-experimentation. Yup, that’s what you gotta do – prototype and start experimenting with your idea as soon as possible as the market’s the only true judge of your business plan! Doing anything else – planning for an IPO, purchasing large amounts of machinery and all are all going to be for naught if the model isn’t validated by the only thing that should ever validate (or invalidate) a business plan – the market itself. If you have an idea, just get out there and test it as cheaply and as quickly as possible. Don’t let anyone tell you otherwise. Don’t get caught up with over-thinking, over-analysis and fear. Just go and do. That’s some pretty good advice that I really need to take myself.